There were two townships organized on January 8, 1880, by the county commissioners - Candor and Star Lake. Candor was one of the first townships organized in the northern tier township and came into existence as a result of the satisfactory petition of twenty-five legal voters residing in township 137, range 41. On the 26th of the same month the first election for county officers was held at the house of A. Bradberry. The names of the legal voters of said township who contributed to its organization were as follows: H. P. Johnson, Samuel Burgner, Charles French, Herbert Kinkle, George B. Grass, John Morneval, T. A. Blem, C. Drake, John Wallace, Isaac M. Spike, Iver Reynolds, H. C. Cook, F. Klug, H. A. Bradburg, Carl Glanex, Robert Schram, William Furnold, F. A. Blossom, Fred Green, A. A. Drake, Daniel M. Still, Frank S. Biekle, Andrew Becke, William Glanex and M. B. Bradburg. This township was the forty-fifth to be organized in the county and this may be accounted for by the fact that it was so far distant from the county seat. Located in the northern tier of townships it is nearly forty miles from Fergus Falls, while its nearest trading center for many years was Pelican Rapids, more than twelve miles distant. The building of the Soo line through the township in 1903 put it in touch with the outside world and has been the means of appreciably raising the value of land in the township. 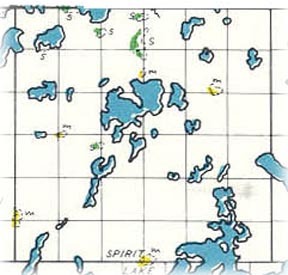 Several lakes are to be found within the confines of the township, the chief ones being Leek, Hand, Loon, Hook, Otter, Cooks, Schrams, Ida and part of Sauer, the latter being mostly in Becker county. In addition to these there are a number of smaller bodies of water scattered over the township. The general elevation of the township is above a thousand feet and the many lakes do not prevent the farmers from having well drained and productive farms. There have been two town sites, platted in the township, Vergas and Elmwood. Elmwood was platted by Martin Aalberg for James and Etta M. Nesbitt and recorded in the office of the register of deeds, July 14, 1911. It is located in the southern part of Candor township, sections 34 and 35, township 137, range 43. The present village, of Vergas was platted and later incorporated under the name of Altona. This thriving little trading center is located on the Soo line in the southeastern part of the township. It was plated for the Minnesota and Loan Trust Company in the fall of 1903, the plat being recorded on October 30. This company platted a number of villages along the Soo line through Otter Tail county, and each plat bears the signature of Eugene A. Merrill, president of the company. The village was incorporated as a result of an election held on February 21, 1905, at which time all of the twenty-six voters of the village expressed their desire by ballot for incorporation. A petition had been presented to the commissioners on the 4th of the preceding January asking for such an election, the petition being signed by thirty-three voters, as follow: Veeder C. Buck, E. S. Ferguson, Edmund Pausch, Charles A. Peterson, A. Eichmiller, F. B. Wilson, John. C. Rieman, C. H. Brooks, Adam Dey, Henry Schultz, Arthur Fankhanel, C. H. Cummings, Edward Sunnenberg, H. Schattschneider, F. C. Smith, E. L. Norton, W. L. Taylor, A. H. Wilcox, Bernhard Stangenes, M. Popplar, James Nesbitt, Albert Ament, John Zeigler, J. 0. Brass, Ralph Hunter, Alvin Herting, Oscar Walde, Philip Eichmiller, J. E. King, William Sauer, Edward Marks, T. J. Randall and Herman Lenke. At this time a census showed one hundred and forty-four people living in the village. The name of the village was changed from Altona to Vergas as a result of an election held November 6, 1906, at which time thirty-one votes were cast, twenty-seven being for the change and only four against it. Vergas has a population at present of two hundred and seventy-five. The village contains a German Lutheran church, a bank, hotel, creamery, planning mill, feed mill and grain elevator. It is on the extreme end of the Soo line in this county and accommodates a large section in the northern part of the county which otherwise would have to travel many miles to another town. The present postmaster is Bernard Staughes. The present village officers are as follow: President, John Bruhn; trustees, E. L. Brooks, John C. Rieman and Phil Eichmiller; clerk, Charles A. Peterson; treasurer, W. F. Ladwig: assessor, Nick Ebersviller; justices, A.	Priske and A. H. Wetmur; constables, H. F. Hinze and Fred Kraus. Places of birth for Candor Township in the 1905 state census.